Ways to Help An Author – and prizes for doing it! May 13th, 2017 by Terri Brisbin & filed under Uncategorized | Comments Off on Ways to Help An Author – and prizes for doing it! Anytime you connect with an author it helps! When you connect with an author via a vendor or other service, it helps a lot! This month I’m in a group promo to highlight two places where you can connect with authors — and then you will receive info automatically about new releases – Amazon and Bookbub. Amazon – well, you all know about Amazon, offers readers a chance to FOLLOW your favorite authors. BookBub – a curated subscription service that points readers to great (Free-99¢-$1.99) digital deals on all vendors – also offers the readers the chance to hear about their favorite authors. 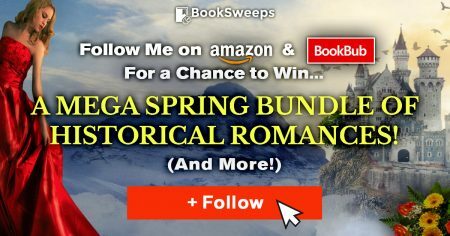 Runner Up #3: Selected from the participants in the Medieval, Scottish, and Victorian Romance section of the promotion, receives 1 copy of each Medieval, Scottish, and Victorian Romance book.